13 January 2019, Cairo, Egypt – On 9 August 2018, a fighter jet, belonging to a coalition led by Saudi Arabia and consisting of other regional allies, dropped a bomb on a busy marketplace in a small village in Yemen. The bomb ended up falling on a school bus and killed 40 children inside. The Saudi coalition has conducted thousands of these airstrikes in Yemen, and they have intentionally targeted civilians a third of the time. The United Nations has denounced the attacks on civilians as possible war crimes. And it was later found that the bomb that killed the children on the school bus was made by the Lockheed Martin Corporation. This bomb was made right here in the U.S. and it’s being used to target civilians in Yemen. The sale of American weapons to Saudi Arabia is especially jarring given that Saudi Arabia has done far worse in Yemen than just killing 40 children on a school bus. They have deliberately attacked not only civilians, but also the things they depend on for survival, such as their roads, sewers, and clean water sources. The destruction of critical water sources in Yemen has led to a massive humanitarian crisis, and has caused the world’s largest cholera outbreak. Targeting civilians and their infrastructure has been considered a war crime since the adoption of the Geneva Convention in 1954. So in this article, let us pose an important question: Why does the U.S. keep selling arms to Saudi Arabia? The answer is much more difficult and complicated than you think. Oil was first discovered in the new country of Saudi Arabia beginning in the 1930’s. During this time, the U.S. began to make alliances with many different Arab countries. The most important one was in 1945, when FDR struck a deal with the Saudi King, Abdulaziz Al-Saud. Saudi Arabia promised the U.S. a reliable supply of oil, and in exchange the U.S. agreed to provide protection to Saudi Arabia. But here’s the kicker – the U.S. Government back then wanted to sell as little weapons to Saudi Arabia as possible, as they believed that fewer weapons would mean less conflict and thus a greater reliability in oil supply. So what changed? In 1967, war broke out between Israel and a group of six Arab states – Egypt, Jordan, Syria, Iraq, Saudi Arabia, and Kuwait. The U.S. was in a pretty big pickle, as they had allies on both sides of the conflict. Rather than making the logical decision of simply remaining neutral, the U.S. ultimately decided to support Israel. This decision outraged the Arab countries, and they declared an oil embargo on the U.S. beginning in October 1973. This resulted in “the oil shock”, as it is known, and oil prices soared. The embargo ended in March 1974, when the U.S. brokered a peace deal between Israel and Egypt. But the Arab states were still reeling from the U.S. turning on them, so to make it up to their allies, the U.S. decided to sell them weapons. By the late 1970’s, oil profits made Saudi Arabia’s monarchy extraordinarily wealthy, and they used that wealth to buy a range of advanced weapons. And the Saudis bought a lot of them. In 1979, the pro-American Shah of Iran was overthrown in an Islamic Revolution. A new government assumed power, which was hostile, ambitious, and extremely anti-American. The U.S. lost a strategic ally quicker than a gang of hungry partygoers devouring a bag of Tostitos. This new threat from Iran caused the Saudis to buy U.S. weapons aggressively throughout the 1980’s. The aggressive purchasing of weapons continued into the 1990’s, as Saddam’s Iraq posed a threat to both U.S. and Saudi Arabia. Arms sales plummeted in the late 1990’s, and almost entirely ceased after the 9/11 attacks, as 15 of the 19 hijackers were Saudis. Arms sales resumed when the U.S. invaded and toppled Saddam’s Iraq in 2003, destabilising the Middle East. The region has continued to decline rapidly year after year, and Iran has become involved in each of the individual conflicts, including the civil war in Yemen, which brings us back to today. 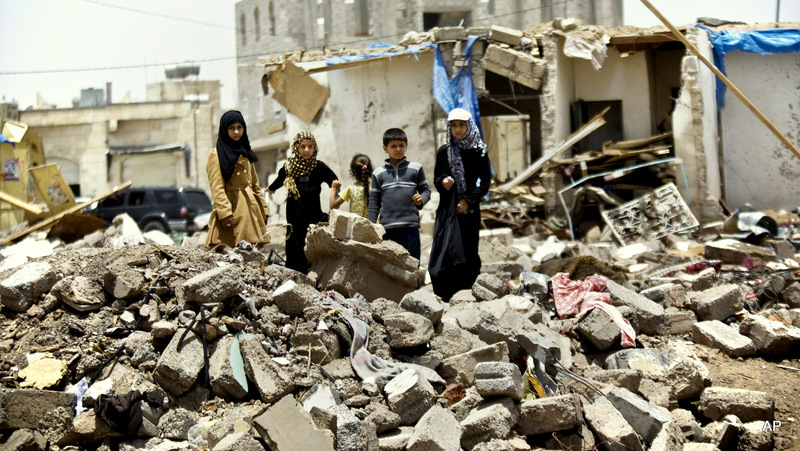 Saudi Arabia sees Iran’s involvement in the proxy wars as Iran closing in on them, and so Saudi Arabia started using their weapons aggressively, targeting civilians such as those children in the school bus in 2018. The original deal in 1945 was supposed to ensure peace and stability in the Middle East. And 70 years later, it would be safe to say that we’re a long way from that. The war crimes in Yemen, coupled with Saudi Arabian Crown Prince Mohammed bin Salman’s ordering of journalist Jamal Khashoggi’s death, has sparked more resistance to these arms sales than ever before. As Americans, we should recognise and prevent the sale of large amounts of weapons to foreign countries, and we should also re-evaluate the US-Saudi relationship, as it has never been about shared values or democracy, but rather, strategic importance and defence interests. Could DNA reinvent data storage? Prison Escape: Is it legal? Copyright © 2017, Dr Chicken Blogs, Inc. All Rights Reserved.